Stickers are great embellishments for decorating your scrapbooking pages but it can be difficult not to overwhelm your page with them. Here I will show you how to incorporate a variety of techniques including stickers, matching patterned papers, paper tearing and inking to create a beautiful and balanced page where all the elements work together. This layout was created using Rusty Pickle Pink Paper Pack 12x12, Brown Bazzil cardstock, light brown cardstock, pink ink, brown ink and Stamping Station Q.T. Babies stickers. Begin by setting aside your Pink Squares paper for the background of the left-hand page and your Pink Gingham paper for the background of the right-hand page. Now take your Lovely Hearts paper. Tear a strip approximately 7.5cm deep to go across the top of your left-hand page. The top of this strip should be a straight edge and the bottom should be the torn edge. Make sure the hearts are the correct way up and adhere in place. Cut another strip of Lovely Hearts paper for the bottom of your right-hand page. This time it should be about 6.5cm deep and have a straight edge on both sides. Again, make sure the hearts will be the right way up. Mat your strip on brown Bazzil cardstock, as shown in the layout. Ink the top and bottom edges of the Bazzil cardstock with brown ink. When dry, adhere across the bottom of your right page about 7mm from the bottom. Again using your Lovely Hearts paper, tear the corner pieces shown in the layout. The piece for the top right corner should be smaller than the piece for the bottom left corner. Adhere your piece for the top right corner but NOT for the piece for the bottom left (we will do this later). Mat your main photo for the left-hand page on light brown cardstock. Ink the edges with pink ink. Mat again on a large rectangle of Pink Crackle Checks paper. This rectangle should measure approximately 23cm by 18cm. Note that this is significantly larger than your photo so make sure you position your photo towards the top right hand corner (please see layout above for exact positioning). Mat once again with brown Bazzil cardstock and ink the edges with brown ink. Adhere to your background, as shown in the layout. Now adhere the piece of Lovely Hearts paper you tore for the bottom left corner. Cut two rectangles of Pink Crackle Checks paper. They should measure approximately 11.5cm by 14.5cm. These are for the right-hand page. Tear two strips of brown Bazzil cardstock. Each strip should be 11.5cm wide and approximately 3cm deep. Make sure one edge is straight and the other torn. Adhere one across the top of one rectangle and the other across the bottom of the other rectangle. 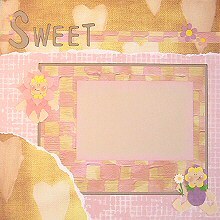 Mat both rectangles with light brown cardstock and ink the edges with pink ink. Position a photo in the middle of each rectangle and adhere the rectangles in place, as shown on the layout above. To finish off your right-hand page, adhere a pink and purple flower to the top left of your left-hand photo and a purple Q.T. Baby to the bottom right corner of your right-hand photo. There is also a little space either under the photos or on the strip across the bottom of the page if you would like to add any journaling. 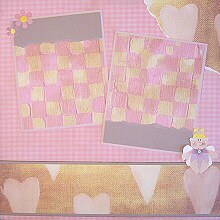 Next, cut a strip of Pink Crackle Checks paper approximately 1.5cm deep to go across the top of your left-hand page. Adhere it approximately 4.5cm down from the top of your page. Using an alphabet template or a font from your computer, cut each letter of your title from brown Bazzil cardstock. Ink the edges of each letter with brown ink. When dry, adhere in the top left-hand corner of the left page, on top of your strip of Pink Crackle Checks paper. Finish off your left-hand page with your stickers. Place a pink Q.T. Baby to the left of your photo and a purple Q.T. Baby in the bottom right corner of the page. Place a pink and purple flower on the right side of your Pink Crackle Checks strip. Finally, place a small pink flower on the first letter of your title. You now have a beautifully balanced page where all the elements work together instead of competing with each other!